A couple who subjected a baby boy to 'wicked cruelty' have both been sentenced to eight years' imprisonment. 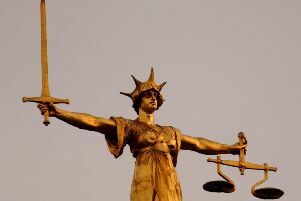 The pair, both from Hove, were convicted of causing or allowing a child to suffer serious physical harm after a trial. Kopinska, of Sackville Road in Hove, was convicted of a separate charge of child cruelty. Jendrzeczack, also of Sackville Road in Hove, pleaded guilty to a charge of child cruelty. In a statement to the media, Sussex Police said the case, investigated by detectives from the Brighton Safeguarding Investigations Unit, first came to police notice after the boy was taken to the Royal Alexander Children’s Hospital in Brighton with a broken left arm. Hospital staff completed a skeletal X-ray and identified 27 further fractures to the child’s body; these included multiple rib fractures, knee fractures and ankle fractures. The child was taken into police protection and placed into the care of the local authority who cared for him whilst a suitable family member could be nominated to look after him. Police say they arrested Kopinska and Jendrzeczak and they both claimed the arm injury was an accident and had no knowledge as to how the further fractures had been caused. At their trial both admitted to lying to doctors about when the child's arm was broken. Jendrzeczak at this point pleaded guilty to child cruelty but Kopinska did not plead to this charge. Experts in paediatric medicine provided evidence of how the injuries could have been caused, describing a twisting motion and a crushing force. This evidence proved vital to the prosecution of the suspects, police said. They identified the fractures as being caused between four and six weeks before the child was seen at the hospital. Judge Christine Henson QC, sentencing the pair, said: "“Each of those injuries was no accident, [they were] deliberately caused. They would have required significant force to inflict and caused immense pain to the child. “Such wicked cruelty is almost beyond belief." Jendrzeczack was jailed for eight years, with an extended licence period of one year. He will be eligible for parole after he has served two thirds of the eight year prison sentence. Kopinska was jailed for eight years. Note to readers: care has been taken not to publish any information that could lead to the identification of the child. This was following an order made by the judge in court. We ask that you do the same in any comments or posts on social media. Thank you.